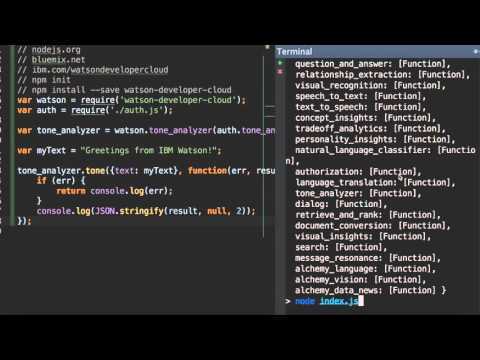 The IBM Watson Developer Cloud (WDC) offers a variety of services for developing cognitive applications, including text and language processing, image evaluation, personality insights, relationships, tradeoff analysis, and a whole lot more. These Watson services are hosted in the IBM Bluemix cloud platform, and each service provides a REST API for interacting with the service. But while the REST APIs are the definitive way of accessing the WDC services, let’s face it: using REST APIs directly in your favorite programming language can be a pain. So, to simplify using the WDC services in the popular Node.js runtime environment, the WDC Node SDK provides an easy-to-use client-side library for all WDC services. The Node SDK delivers high-level access to all the WDC services without requiring you to become a REST expert or write your own methods to authenticate to the Bluemix platform in which the WDC services are hosted. In short, the WDC Node SDK makes it easy to add cognitive capabilities to your Node.js applications. The WDC Node SDK is open source and is freely available under the Apache 2 license. Using the WDC Node SDK simplifies WDC application development for you and every other Node.js developer by providing a simple, central set of functions that save you from the repetitive nitty-gritty of REST application development. By contributing, you can save yourself from maintaining your own common functions and build some cognitive geek cred with your fellow developers. As the cognitive capabilities of the Watson Developer Cloud services continue to improve, you might find that you need other high-level functions to access the WDC REST APIs in specific ways. And chances are, if you need a new function, other developers might too. Contributing to the WDC Node SDK lets you get your enhancements and great ideas into the WDC development mainstream to help make cognitive application development easier for everyone. How will WDC Node SDK help my business?